The Korea Tourism Organization (KTO) in London welcomes you to our fascinating destination and we are here to assist you in every way possible to ensure you get the most from Korea. The KTO London is the first step of your journey to Korea and our staffs are happy to supply you with a varied selection of literature and advice to make your trip even more enjoyable. So before you embark on your travels be sure to come and visit us here in London first. We are available to the general public by phone, email, through our social media channels and we welcome walk-in visitors. In all cases we can provide prospective visitors with a wide and varied selection of promotional guides and materials. 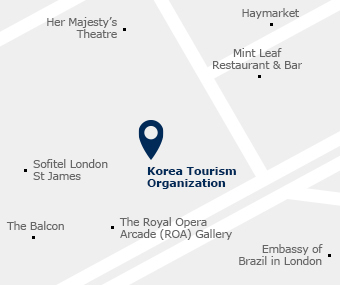 KTO London office is continuously working on relationship building with potential partners including the Korean Embassy, the Korean Cultural Centre, KOTRA, Korean Air, Asiana Airlines and a broad spectrum of related industry colleagues. KTO London along with airline partners, as well as DMC's is educating travel agents through product training. KTO London is continuously working very closely with current and potential tour operators, jointly with airline partner and DMC's to bring the best and most competitive packages to outbound travellers within our geographic remit. KTO London is creating co-marketing advertisement campaigns with key partners throughout the year. KTO London is organising fam trips for media partners (Print/TV) and wants to educate all travellers through inspiring journalists and producers to create stories/series in leading newspapers, magazines and TV channels. Equally, KTO London is organising fam trips for tour operator partners so they can share their knowledge with their clients and increase sales. KTO London is participating in important trade and tourism fairs, travel marts and exhibitions in different regions across the UK, Ireland and Scandinavia. KTO London is participating in various consumer activities and providing consumer engagement activities through KTO London Facebook and Twitter pages. KTO London is organising road shows to provide the best platform between DMC's and tour operators for their knowledge, information and future business.